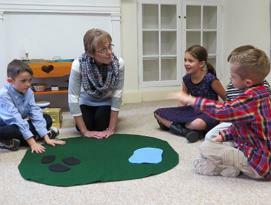 Children & Worship is our worship program for children ages 4 through second grade. It is held in conjunction with our 10:30 AM service during the months of September through May. The children worship with the congregation through “Time for Young Disciples,” then they are escorted to the Children’s Worship Center to continue their worship in a way that is accessible to them. Through storytelling, a response of wonder at God’s presence, and artistic expression, children develop an understanding of the traditions and narratives that shape our faith. These young disciples are then able to worship more deeply and meaningfully with the larger congregation.